This tutorial will show you how to empty the continuous ink system. 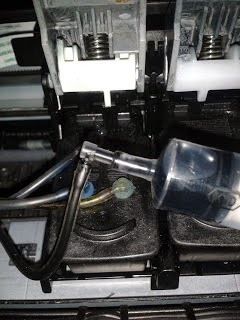 In this post, we will show a simple way to remove the ink from the continuous ink system, just follow the instruction below and get the tools required to do so. To remove the ink from the continuous ink system you do not have to flip the tank, we will show you a very practical method to remove the ink without mixing it with other colors. There are several reasons why we need to empty the continuous ink system tank: The ink has not been used for a long period of time, dirt or an object access the tank, or the ink has been put in the inadequate tank. The syringe to remove the ink from the tank as shown in the picture above, you must empty the tank. When the process is complete, clean the tank with alcohol and then add water in the same way you remove the ink. If you want to clean every single ink tank, you do not need to use a different syringe for each tank. One syringe can be used for every tank, the process must be done slowly and it is recommended to remove ink system filter.